When former Governor General of Canada and author David Johnston spoke about why he choose to write his latest book Trust: Twenty Ways to Build a Better Country, his lighthearted talk turned serious. “I wrote it because I was worried,” said Johnston at his speaking engagement Wednesday night in Collingwood at New Life Church. Johnston came to Collingwood this week to promote his new book, discuss the state of trust in public institutions and media and share anecdotes from his life. The talk was moderated by Janet Fairbridge, foundation director with Hospice Georgian Triangle, who started by asking Johnston questions before turning the floor over to audience questions. “How do we establish trustworthy persons, and how to we establish trustworthy relationships?” mused Johnston. Johnston, the 28th Governor General of Canada, has written more than 25 books and served as the Governor General of Canada from 2010 to 2017. Trust: Twenty Ways to Build a Better Country interweaves personal stories from Johnston’s life into morals and lessons, some of which he shared during the talk. Johnston relayed a story about resigning from a Final Club at Harvard University (similar to a fraternity) when he was a student due to the club not allowing a Nigerian student to join. “Be true to yourself and your values,” said Johnston. The proceeds from Johnston’s book are going toward the Rideau Hall Foundation, a charity he helped co-found. He talked at length about the importance of volunteers. “If you ever want to measure the health of a community, just look at the number of volunteers in that community,” said Johnston. The former Governor General also talked about the most influential figures in the average person’s life. The talk was put on by Hospice Georgian Triangle Foundation, with presenting sponsor Wayne Noble of Noble Insurance. Johnston’s book is available now on Amazon and through Indigo. As part of a process to streamline the operating structure of the Hospice Georgian Triangle Foundation (HGTF) I am pleased to announce Janet Fairbridge has accepted a new position as Foundation Director effective January 31, 2019. This new leadership role reflects the need for the Foundation to improve its focus on the critical task of building community awareness for sustainable Hospice Georgian Triangle (HGT) funding. With responsibility for overseeing HGTF administration and programs, Janet will lead the fundraising team and report directly to the HGTF President. Key duties include fundraising, marketing, communication and community outreach. This appointment reflects the confidence the Foundation has in Janet. Since 2014, Janet has been a key HGT ambassador in the community, helping HGT to achieve its critically important fundraising goals. It’s important to remember that funding for more than half of HGT’s operating costs is made possible through community giving. I’d like to thank our colleagues on the Hospice Georgian Triangle board for their assistance with this reorganization. Please join me in welcoming Janet to her new position. 500 Reasons to Attend the annual Care Gala! 1. Bid on an all-expenses paid trip for two to London, England. 2. Win tickets to see John Tavares and Auston Matthews power the Maple Leafs to victory. 3. Dance to the music of the Black Pearls and their great renditions of Tom Petty, Roy Orbison and George Harrison classics. 4. Watch the sunset over Georgian Bay from the beautiful new Alpine Ski Club. 5. Score a berth on a luxury yacht and spend seven nights sailing from Panama City. 6. Celebrate with your neighbours and friends! 7. Enjoy complimentary wine with your gourmet dinner. 8. Whet your appetite with the delicious dinner choices, prepared by Collingwood’s own Men with Knives. 9. Climb the Rocky Mountains by winning a heli-hiking package for two. 10. Use the Gala as an excuse to buy a new outfit. It’s a worthy cause after all! 11. Surprise your partner with a romantic all-expenses paid train trip and weekend accommodation in Quebec City -- up for bid at the Gala! 12. Score big with four tickets to see the reigning Grey Cup champions. Go Argosssss! 13. Prepare to be amazed by winning two VIP tickets to Cirque du Soleil's production of Corteo this Fall in Toronto. 14. Live on the edge. Play the Care Gala’s exciting 50:50 Draw. 15. Impress the grandchildren by winning your own exclusive skating party for 10 at Blue Mountain’s Woodview Mountaintop skating facility. 16. You’re in town on Friday, September 21st and love cocktails at 5:30pm. 17. Satisfy your inner Film Critic. Win two season tickets to the Collingwood Cinema Club. 18. Carve the ultimate line down Blue Mountain by scoring unlimited demo skiing from Squire John’s. 19. Earn the opportunity to test your taste buds as guests of the Italian Trade Commission at their annual wine schmooze. 20. Hit pay dirt by winning dinner for you and your friends at Brunello’s and other fine Collingwood eateries. 21. Work on your tan. Cop tickets to the Rogers Cup. 22. Display your online dexterity by buying your tickets at www.hospicegeorgiantriangle.com. 23. Score the opportunity to secure Burger Bob to cater dinner for you and 49 family and friends. 24. Be able to boast to your friends you were at the best Gala of the year. 25. Show off your cool. Or hot. Dress is elegant but casual. 475. That’s the estimated number of families Hospice Georgian Triangle will support through a variety of programs offered in patient’s homes in our community and at Campbell House. The Hospice team of professionals and volunteers helps support quality of life through management of physical, emotional and spiritual needs. HGT’s services are made possible through generous donations at fundraisers such as the Care Gala and offered at no cost to individuals and their families. The annual Care Gala, an exquisite evening in support of Care at Hospice Georgian Triangle, will be held on Friday, September. 21, 2018. This year we’re at the beautiful new Alpine Ski Club. It’s a bit bigger than last year’s venue but remember tickets sold out in 2017. Or, contact Rebecca Gee at GeeR@hospicegeorgiantriangle.com or at 705-444-2555, extension 7523. The Black Pearls to headline annual Care Gala festivities! One of Toronto’s most popular bands, The Black Pearls, will have dinner goers stompin’ in their chairs at the Care Gala on Friday September 21 2018. The Black Pearls are celebrated for covering the music of the Traveling Wilburys plus hit songs of all the members: Tom Petty, Roy Orbison and George Harrison, Jeff Lynne (ELO) and Bob Dylan. This year we’re at the beautiful new Alpine Ski Club. It’s a bit bigger than last year’s venue but remember tickets sold out in 2017. Don’t be disappointed. Book your tickets today to support this critical part of the annual fund-raising activities for HGT. The goal is to raise $100,000. Cocktails are at 5:30pm. Dinner is by Men With Knives. Lots of great auction items. WestJet flights. Via Rail trips. Leaf tickets and more. For more details on The Black Pearls check them out on their Facebook page. Or call Rebecca Gee at 705-444-2555, extension 7523. Gorgeous Yacht cruise heads Gala live auction prizes! In 2017, Hospice Georgian Triangle raised $100,000 at the fabulous Care Gala, thanks partially to some terrific auction items. This year we are continuing with the theme of offering Dinner participants “experiences” to bid on. Thanks to Gordon Dreger, who grew up skiing the hills of Blue Mountain, we have a mega-yacht cruise for two as a grand prize. The winning bidder has the option of a cruise between Havana and Cienfuegos on the M/Y Variety Voyager, or a cruise between Panama City, Panama and Puerto Caldera, Costa Rica on the M/S Panorama. Each cruise is for seven nights in an outside cabin and includes all accommodation and meals. These are luxury yachts with a limited amount of cabins. For example, the Variety Voyager holds only 72 passengers. We’d like to thank Gordon and his new travel company Wheel & Anchor for this wonderful prize that’s valued at up to $15,000, depending on the time of sailing. The annual Care Gala, an exquisite evening in support of Care at Hospice Georgian Triangle and Campbell House will be held on Friday, Sept. 21, 2018. Or, you may contact Rebecca Gee via email at GeeR@hospicegeorgiantriangle.com or, call 705-444-2555, extension 7523. HPCO Accreditation is an independent certification program dedicated to improving the quality of care for palliative individuals, their caregivers and the bereaved. Any hospice organization achieving this accreditation has undergone a detailed assessment, including multiday on-site audits to ensure their organization has strong governance, operational, service delivery, fundraising and quality improvementprocesses in place. HPCO Accreditation gives assurance to individuals and families receiving care, partners, donors, funders and volunteers that HGT is in compliance with industry standards and has been accredited based on a rigorous review of operations and performance by industry peers. 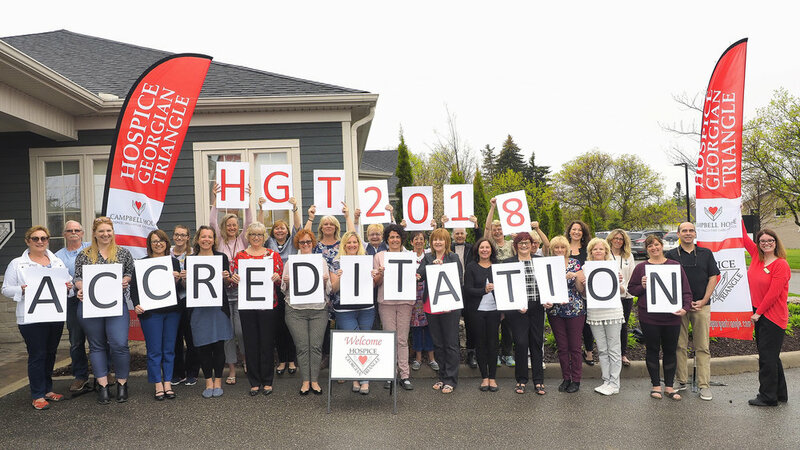 For more information regarding HGT’s accreditation, please contact Kelly Borg, Executive Director of Hospice Georgian Triangle at 705-444-2555, extension 7520. The Collingwood Cinema Club has done it again! Not only do they bring the best of Canadian and International Films to our community, but they also take care of our community by giving very generously to HGT. 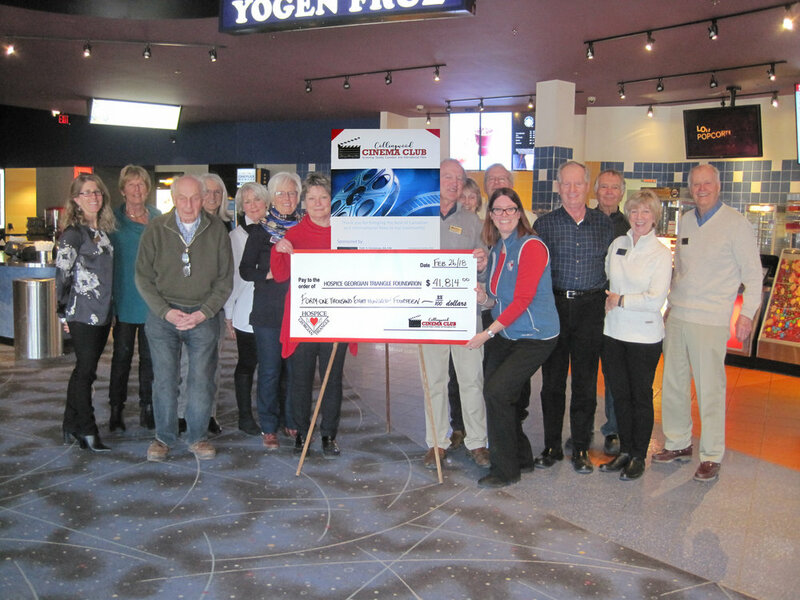 This year’s donation from the Collingwood Cinema Club and their dedicated subscribers was over $41,000! Amazing!!! HGT is so honoured to be the charity of choice of this incredible group. On behalf of the 570 patients and families that you have supported at Campbell House since our opening in August of 2014, and the many, many more supported by HGT’s Lighthouse Integrated Care programs in our community, thank you to all of the Cinema Club members and volunteers for your continued support. HGT is feeling the love today, especially from the Rotary Club of Collingwood South Georgian Bay! Donor Relations Coordinator Janet was honoured to receive the cheque from this hard-working group of Rotarians outside of The Peak 95.1 FM studios, during the second annual Give your Heart to Rotary Radiothon. This grant will go towards our new Lighthouse Integrated Care program, enabling HGT to better support individuals in our community when they need us in early stages of a diagnosis with personalized, and free, assistance in navigating the healthcare system. If you haven't done so yet, tune in to 95.1The Peak today, give them a call or go online and make a donation to hear your favourite tune (or dedicate it to your Valentine!) and help the Rotary Club of Collingwood South Georgian Bay continue with their amazing work in supporting our community. Thank you so much Rotary Club of Collingwood South Georgian Bay!!!! Stayner Lions Club presented a donation to Hospice Georgian Triangle. We are so grateful for your continued support and following within the Lion Clubs Mission of making life better in our community.